Though we will have to wait till June 2012 for Chanel’s Paris-Bombay Metier D’Art Show collection to hit the shelves, last week’s pre-fall show offered up a high-wattage glimpse at the goodies to come. Peter Philips, Global Creative Director of Chanel Makeup, brought out several of the Indian-inspired products to dress up the models for the show. 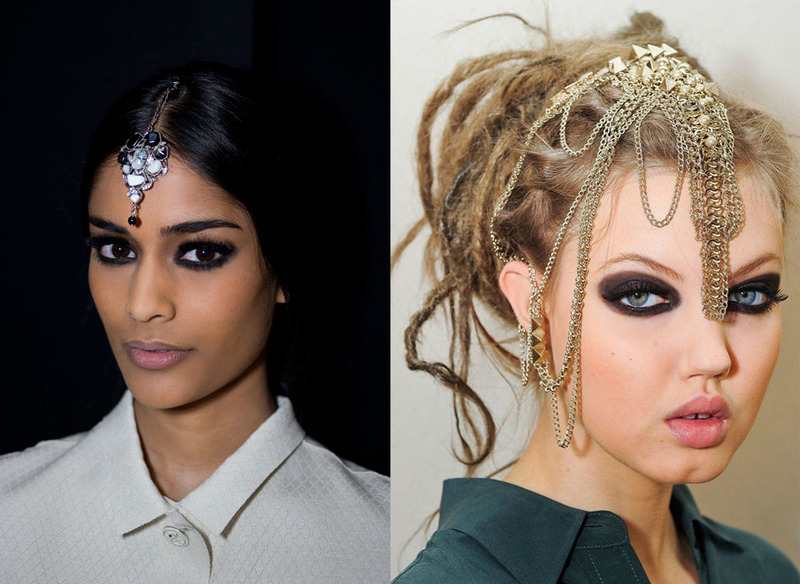 And what a show it was – especially the dramatic eyes that form the cornerstone of a traditional Indian look! Philips created the classic-with-a-contemporary twist statement look by circling the eyes with the black-brown Illusion d’Ombre Long-Wear Luminous Eyeshadow in Nirvana and then merging it into a thick triangle at the outer corners. He further amped up the effect with generous helpings of the Stylo Yeux Waterproof Long-Lasting Eyeliner in Ebene and layering it with Le Crayon Khôl in Black on top. The lashes were played up with the Mascara Inimitable Intense in Black. In keeping with the Indian penchant for creamy complexions and a touch of bling, Philips also added golden highlights on the cheeks and eyes using Route des Indes de Chanel – a limited edition palette that he created especially for the show. And as for the Chanel Le Vernis fans, this was the debut of the Le Vernis Nail Colour in Diwali – a light golden shade “inspired by the famous ‘festival of lights’ that takes place in India”. Glad you liked it…and to think Lagerfeld pulled this off without even once visiting India!! Can’t make up my mind on whether that’s good or bad. What do you feel?